This apartment with a breath-taking view of the Meuse River, which is dammed here, is located between Den Bosch and the fortress town of Zaltbommel, in the midst of Dutch river country. The first floor of an outbuilding has been converted into an apartment. Thanks to the two enormous windows you can enjoy the view from inside as well. The view is even better from the roof terrace. The surrounding meadows will make you feel immersed in nature. Since the studio is situated in an outbuilding with its own entryway, you have plenty of privacy. The apartment has its own private dock, so you can swim, fish and enjoy a variety of water sports. You can even dock your own boat here, though boats over 8 metres in length require a permit. The dike next to the apartment is part of a lovely walking and cycling route. You can store bicycles and charge their batteries on the ground floor of the building. 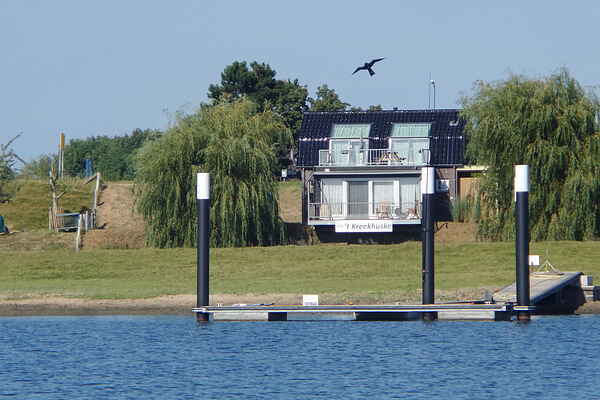 The 'Island of Nederhemert Zuid', located on the opposite side of the river, is within walking distance and can be reached by ferry. You can also visit Ammersoyen Castle, Loevestein Castle, Well swimming beach, Efteling amusement park or the city of Den Bosch. The fortress towns of Heusden and Zaltbommel are just a bike ride away.